Plantains are a staple food in many parts of the world and are prepared in countless ways. In West Africa, they are often served with a tomato stew called "Red Red" for the color of the palm oil and the tomatoes it is made with. In a large bowl, cover the chana dal with boiling water. After it cools down to room temperature, cover it and store in the refrigerator overnight. About 1½ hour before serving time, drain the chana dal. Cover chana dal with plenty of water in a large saucepan, and bring the uncovered pot to a boil over high heat. Reduce heat and simmer until tender, 25 to 30 minutes. Drain the dal in a strainer. Return the empty pot to the stove. Heat 2 tablespoons of oil and garlic cloves over medium heat. Sauté garlic until it begins to brown, then remove the garlic and discard it (this keeps the dish low-FODMAP). Add the ginger and sauté until it begins to brown. Add the chana dal, tomato paste, crushed tomatoes and chile pepper. Simmer the stew, uncovered, for 30 minutes, stirring occasionally. Meanwhile, peel the plantain by slicing off each end, running a sharp knife down one side, and easing the skin away in one piece. Slice the plantain into bias-cut medallions about ½ -inch thick, to maximize the surface area of each slice. Pour canola oil into a medium skillet and place over medium heat. When water flicked from your fingers sizzles on contact with the surface of the oil, use tongs to lay each slice of plantain in the oil, being careful not to splash yourself. Try not to crowd the slices, as they will stick to each other; if they won't fit all at once, you may need to fry them in two batches. Allow the plantain slices to cook, jostling them occasionally with the tongs to prevent them from sticking to the pan. When the bottom edge of a slice turns dark brown, carefully flip it to continue cooking. When both sides have become dark golden brown, 8 to 10 minutes, remove the plantain slices to a paper towel-covered plate. 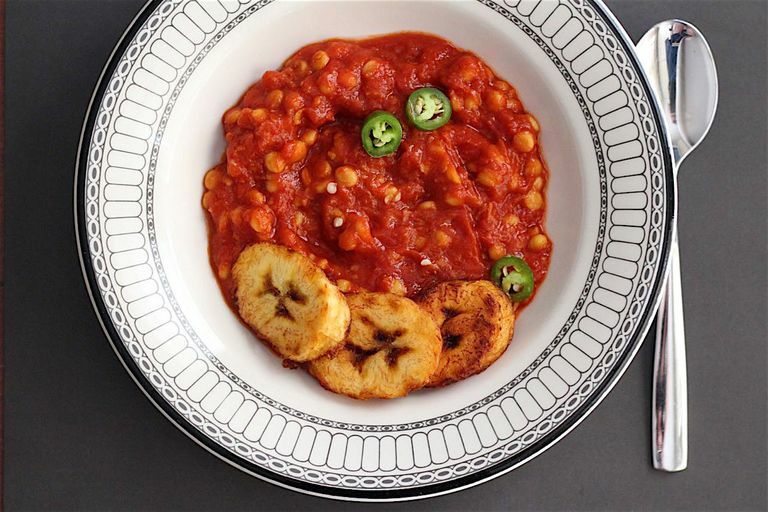 Divide the stew into 5 bowls and garnish each with several slices of fried plantain. Tomato stew can be served over rice or millet, without the fried plantains, for an un-fussy, filling, vegan meal. Red Red often features dangerously hot scotch bonnet peppers or the like. You can adjust the heat of this Americanized tomato stew to your preference by varying the type and amount of peppers. We like small (2 to 3-inch long) serrano or Thai green peppers in this dish; if you prefer less heat you could try larger, but milder, Anaheim, banana or poblano peppers instead. Which Is Healthier: A Banana or a Plantain?